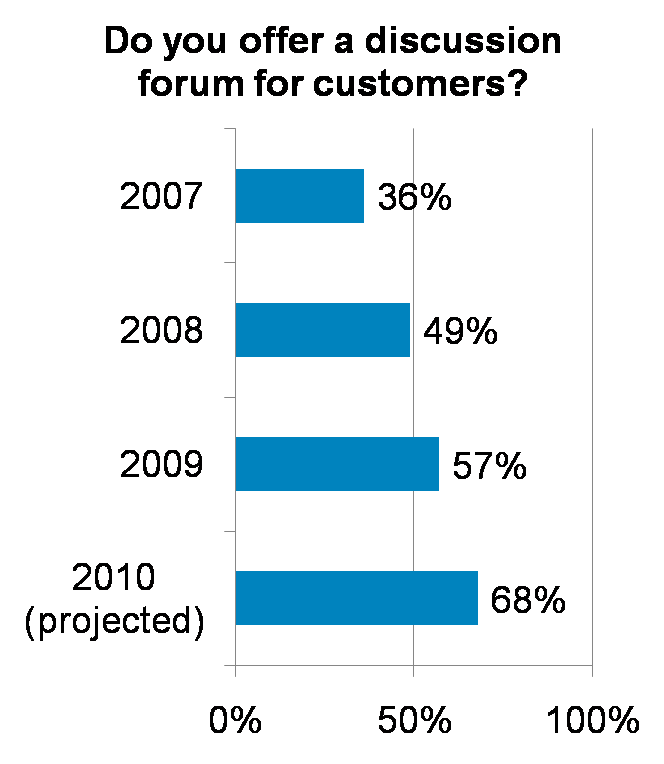 A third of members had a forum live in 2007, jumping to almost half in 2008, up to 57% last year, and based on planned spending I’ve estimated forum adoption in 2010 will be over two-thirds of members, closing in on 70%. My 2010 Member Technology Survey will be launching in the next couple of weeks, so soon I will have accurate 2010 numbers to share. There are a lot of problems with the traditional philosophy of CRM, i.e., marketing, sales and service organized around the customer. One critical problem: where’s development in this picture? In a Web 2.0 world with customers demanding more influence and transparency regarding products, not emphasizing and enabling the customer:development relationship could be fatal. I’ve been thinking about this a lot after spending time with Compuware last week to better understand their Changepoint solution, which in effect enables companies to organize around the product–not the customer–yet still actively involve customers at every step. Compuware’s Product Portfolio Management (PPM) view of professional services (PS) and professional services automation (PSA) fills the void left by CRM, and for B2B companies in particular, seems a much more effective approach. Instead of marketing/sales/service, the Changepoint macro process is New Product Development > Release Planning > Project Execution > Product Support. I was already familiar with Compuware’s PSA expertise; their PSA solution is highly adopted by TSIA members with strong satisfaction scores. But I didn’t know they offered a full suite of tools for development and technical support, including detailed bug and enhancement tracking, development project management, support incident management, customer self-service, and customer input on products a la idea storming. And, the product offers richly customizable dashboards to view everything. So much of TSIA’s view of the industry involves service and development working more closely together. Making the product easier to support. Adding features to enable remote monitoring and maintenance. Prioritizing bugs and enhancements in order of customer impact and cost to support. 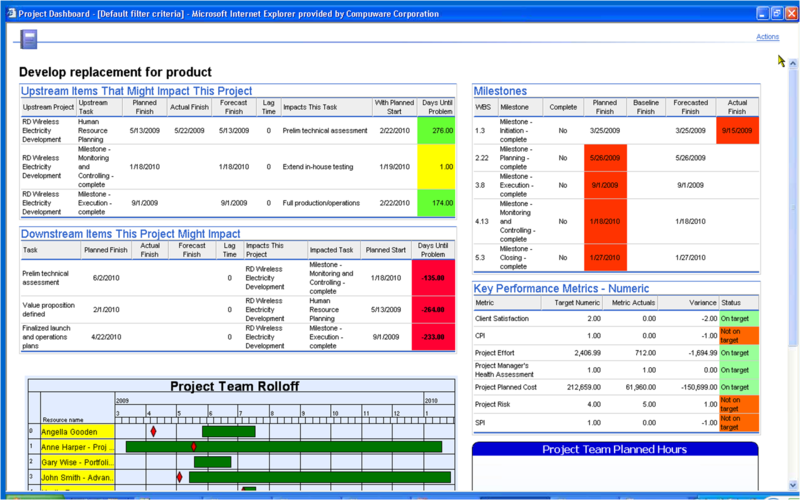 Adding maintenance tools or industry versions to cut implementation project time. On and on. None of these problem will be solved by CRM, but incorporating an PPM view of customer management could. For companies who don’t have their support incident or PSA software integrated to their development tools, you should really look at an end-to-end demo from Compuware to understand the value of viewing customer engagements and interactions in context of product development. It was certainly eye opening for me. I’m doing a webcast with Compuware on March 4th at 10am PT, here is a link to register. Please join us for a look at linking practices to business results and learn more about the Changepoint solution. Thanks for reading, and let me know if you have any questions. As we head into a long weekend, I thought I would close the week on a positive note. One of the side effects of being a long-time spokesperson, ombudsman and cheerleader for the customer service industry is that friends tend to save up their worst service stories and when they see me, I get an earful. I don’t think I’m personally at fault for every problem in the world of service, but apparently in the views of some, if I was doing a better job, they would never encounter a poor service experience. Last night I met some friends for cocktails, and I’m happy to report there wasn’t a single customer service horror story. In fact, it was just the opposite. The topic of discussion was a $400 pair of Logitech ear buds my friend Ed received for Christmas. They stopped working. Naturally, I made dismissive comments about people who buy $400 ear buds, but I was the lone non-audiophile in the crowd and was quickly shouted down. After an initial call to service, and an unsuccessful attempt to track down a receipt, Ed called Logitech customer service back to find out what his options were, thinking he was out of luck. Enter Shawn at Logitech. My friend loved Shawn. He raved about Shawn. Shawn was sincerely sorry my friend had experienced a problem. Shawn was excited about the Logitech products and wanted Ed to love his ear buds. Shawn spent a lot of time with him, walked him through diagnostics to identify the problem and ultimately, dispatched a part that should fix the problem. For once, instead of making excuses about increased complexity, poor accent training, brusque agents and long wait times, I was basking in the glory of someone on Cloud 9 because of a perfect customer experience. So I asked the million dollar question: Are you more likely to buy Logitech products in the future because of this experience? His response? Not only was he going to actively shop for another Logitech product to buy, he strongly recommended we all do the same. Now that’s turning an upset customer into a satisfied AND loyal customer. All with one phone call. So Shawn at Logitech, thank you for making me the hero instead of the goat for once. And to all of the nay sayers who think customer service is declining, here’s my challenge to you: buy more Logitech products, and if you encounter a problem, ask for Shawn. I wish everyone a wonderful long weekend, and as always, thanks for reading! Now in its eighth round, the Recognized Innovator Awards recognize TSIA partners for outstanding innovation in products and services. The awards will be presented at our Spring Technology Services World Conference, May 3-5 in Santa Clara. Innovation in Knowledge Management (KM). Creating, maintaining and leveraging content to speed issue resolution and project success is not only a core process within every technical support operation, but increasingly field service and professional services are launching KM initiatives to share learnings from the field across a global operation. The Recognized Innovator in this category will provide documented case studies of how their technology and/or services are enabling service organizations to more easily publish knowledge and effectively use that knowledge to improve business results. Innovation in Value-Added Services. As documented in “Complexity Avalanche,” Value-Added Services (VAS) programs enable customers to fully consume purchased products and services, helping them quickly receive full business value and speed the repurchase cycle. In addition, VAS programs are providing new revenue sources for budget-strapped service operations. The winner in this category will have documented case studies showing how their technology or services are being leveraged to boost service and support revenues through delivery of Value-Added Services. Innovation in Emerging Channels. According to TSIA survey data, a quarter of TSIA support services members are leveraging video sharing sites such as YouTube to communicate with customers, and 36% are offering some level of support via micro-blogging channels such as Twitter. Support organizations are struggling to not only identify which emerging channels to support, but there is little ‘best practice’ information available on effective customer management via social media. The Recognized Innovator in this category will provide documented case studies of how their technology and/or services are enabling service organizations to meet and exceed customer expectations for support via emerging channels without breaking the bank. One winner and one finalist will be selected in each of the three categories. Submissions will be reviewed by a panel of judges, including industry experts and technology-savvy association members. Finalists will be publicly announced on Monday, May 3rd. On Tuesday, May 4th, I will lead two tours of the finalists’ booths in the Technology Services Expo. Winners will be announced and presented with their awards during the Service Revolutions Awards Luncheon at the conference on Wednesday, May 5th. One new award will also be presented for Best Innovation Demo, voted on by Innovation Tour attendees. I’m now recruiting the judges panel for the awards. If you participate, you will only judge one category, and your total time commitment is 30-45 minutes–definitely less than an hour. If you are interested in being a judge, please email me at john.ragsdale@tsia.com. I will recognize the names of all judges during the awards presentation. You are currently browsing the Ragsdale’s Eye on Service weblog archives for February 2010.